"This is a Polish way of making chicken stock. It is very rich because of the stewing hen. A stewing hen is an older chicken, therefore it is much richer tasting than fryers, roasters, etc. It is a clear, rich broth that I fed to my children. They still ask for it when they are feeling sick. It is truly the Polish cure for anything when you're feeling down and out. You can also use this clarified soup as a base for chicken noodle soup." 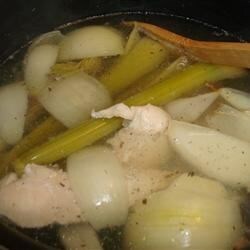 Place chicken, celery, and onion in large stock pot. Cover ingredients with water. Bring to a rolling boil. Skim off excess fat. Reduce heat to simmer, and cook 2 to 3 hours. Remove chicken and vegetables. Strain soup, using cheese cloth. See how to make flavorful chicken stock in five simple steps. I used the remains of a roasted chicken, which was highly seasoned. Worked out well! I gave this only 4 stars because without seasonings this would be too bland. I added fresh ground pepper, garlic salt, basil, & pinch of salt. It was still a bit lacking but a great start. I used a slow cooker and it worked out well however you must add seasonings--bay leaves, basil, etc. to make this a five star recipe.